Though Weebly offers creating blog as a free option if you want to build a complete blog site then Weebly is definitely not an option for you due to various restrictions. Here we discuss the limitations and restrictions of creating a blog with Weebly. Weebly does not offer an option to copy your existing blog to a new site. This is a very danger issue with Weebly since it’s a common practice among webmasters to create a content site consisting of single blog page. In this case it is very difficult task for webmasters to split the complete site into a content site and separate blog later point of time. Moreover, the blog posts if deleted by mistake can’t be retrieved since there is no auto backup system available in Weebly. Migrating your blog content to another hosting provider is a tedious task since Weebly blog does not have an option to import XML feed. The feed contains only the latest ten posts which is of not real use if you have hundreds of thousands of posts. Learn more drawbacks of Weebly. Weebly blog comment control is very simple system which makes the spammers work easy to generate auto submissions irrelevant to the blog content if you don’t set captcha code verification. You can’t add a comment control systems like Disqus or comment through social medias. Weebly blog post does not display the author name hence if you have a group of editors and want to show different author name for each post then Weebly blog is not an option for you unless Weebly comes up with an interface change. 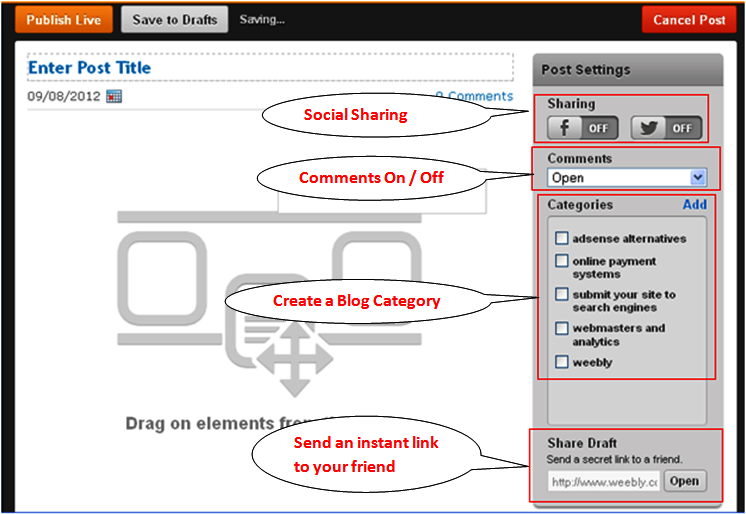 By default last 10 blog posts will be displayed in one page and there is no option to customize the number of posts to be displayed in a single page. There are no sidebar widgets for displaying popular posts, recent posts, featured posts and comments. No possibility of creating sub-category and no breadcrumb option available. Content sharing is restricted to only two social media sites Facebook and Twitter. Weebly blog layout consists of two columns one is for main content and the other is for sidebar. Though you have an option to remove the sidebar by editing CSS, there is no option to customize your blog layout or choose new layout. When a free Blogger or WordPress accounts offer more customizable blog templates even Weebly Pro users have no option to customize the layout. You will not be able to display your ads like AdSense inside the blog content. The only option to display your ads in the Weebly blog is the sidebar. Weebly offers blog in addition to its content management system basically built for content sites. In front of the blogging capabilities of WordPress or Blogger it is not recommended to even try out with Weebly blog as a standalone site. If you have content site then Weebly blog can be added within a content site in order to announce important activities from your main site.